Bula Vinaka, Namaste and Welcome to the website of the Fiji Embassy here in Washington D.C. I hope that everyone visiting this site finds its content not only informative but also a useful tool in providing guidance to one’s area of interest on Fiji; whether you are a student intending to widen your intellectual horizon, an intending visitor wishing to experience a pampered and relaxed get-a-way, a potential investor seeking business opportunities in the “South Seas” or a fellow Fijian or a Pacific Islander missing the warmth of the tropics, I extend a warm welcome and invite you to learn a bit more about my island home, Fiji, and the Pacific Island region where it is located. There will be improved welfare for all including good health and education, better housing, universal access to energy, potable water and sanitation, strong institutions, good governance and minimal crime, sustainable urban areas, empowerment of all women and girls, and a sustainably managed land and aquatic environment. The process of building a better Fiji for all Fijians will undoubtedly be a demanding one. 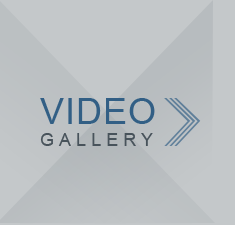 It will challenge traditional ideologies and existing development paradigms. It will also require steadfast political will and genuine support/partnership from all stakeholders including Government, the private sector, civil society organisations, development partners and the community. The 2013 Constitution already provides the required sustainable platform for this structural reform because it contains a Bill of Rights that provides every Fijian with socio-economic rights that include rights to education, to economic participation, to work and a just minimum wage, to reasonable access to transportation, to housing and sanitation, to adequate food and water, to social security schemes, to health, freedom from arbitrary evictions and to environmental rights. The Government has stated that this sustainable development journey will be focussed in delivering a just and fair society; uplifting of the disadvantaged in all communities; merit-based appointments and equal opportunity for all Fijians; mainstreaming of the iTaukei in a modern, progressive Fiji; and a transparent and accountable government. 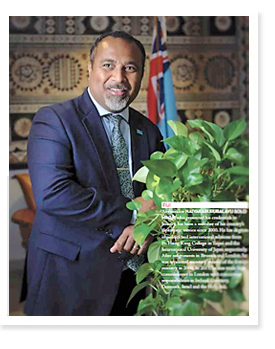 To have any chance of success, the path towards this vision will need to be built upon the goodwill of all Fijians in order to address the disparities that currently exist in accessing basic services and economic opportunity. 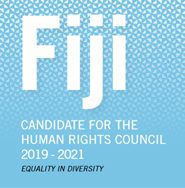 To the growing number of Fijian men and women and your respective families residing in the USA, Canada and Mexico as a result of your recruitment into national, regional or international institutions in the region, I hope to have the opportunity in the coming months to meet and discuss these positive developments in Fiji in some detail. This Mission also hopes that this website will also improve our delivery of those consular services you may require as Fiji citizens. We have also provided on this site important links to relevant government ministries and departments in Fiji that can also assist in providing important information to intending visitors and investors alike. In order for this Mission to meet its core objectives here in the USA, I will welcome your views and opinions on how we can best take advantage of this information highway to improve our services and meet our calling as the “Window into Fiji”. As a window of opportunity, please feel free to pass on to your friends this website to enable them to know Fiji and what Fiji can offer to citizens of our global village. Vinaka saka vakalevu, Dhanyavaad and Thank you for honouring us with your visit. Ni sa bula vinaka, Namaste and Happy New Year to all our Fijian families and friends in the USA, Canada and Mexico. Check out their catalogued Fijian masi, voivoi, kuta, pottery, wamere, mother of pearls, coconut products and textiles.